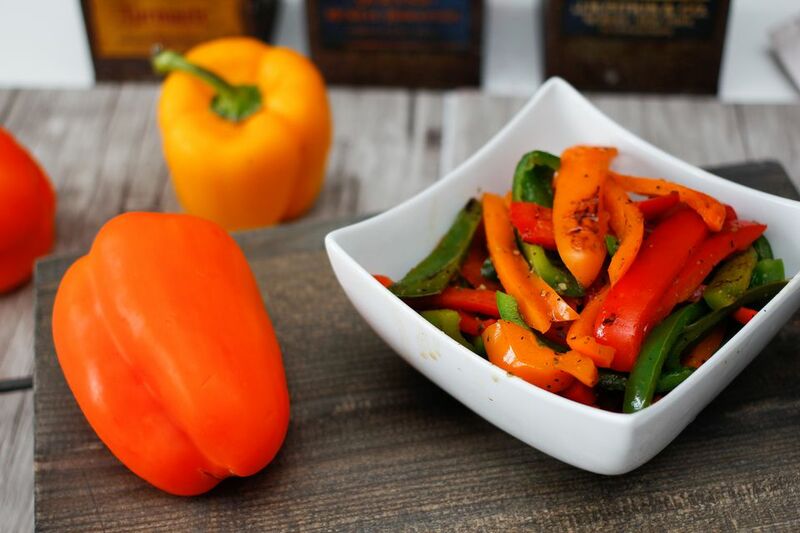 Pan-roasted peppers is a super easy side dish recipe that brings out the natural sweetness in bell peppers. Use any combination of colors you like! Bell peppers are a wonderful vegetable (technically a fruit, but sold as a veggie) that are high in fiber and vitamin C.
Cooking bell peppers brings out their sweetness and makes them very tender. They are delicious served as an accompaniment to roast chicken, meatloaf, grilled steak, or a pork roast. You can find many different colors of bell peppers in the market today; from orange to purple and from yellow to white. Choose the ones that look best for this simple and nutritious recipe. And always buy peppers that are firm, with no bruises or soft spots, and smooth skin. Sauté the peppers, stirring and turning frequently, until the pepper skins start to blister and turn brown in spots. Add the water, Italian seasoning, salt, and pepper. Cover the pan and cook for 1 minute so the peppers steam. To prepare peppers, cut them in half and pull the two halves apart. Remove the seeds and most of the membranes, along with the top stem. Rinse the peppers well and cut into strips or chop.